I TELL MY PATIENTS THIS AT PHYSICAL THERAPY! HOMEMADE ICE PA - ProudMummy.com the Web's Community for Mums. I TELL MY PATIENTS THIS AT PHYSICAL THERAPY! 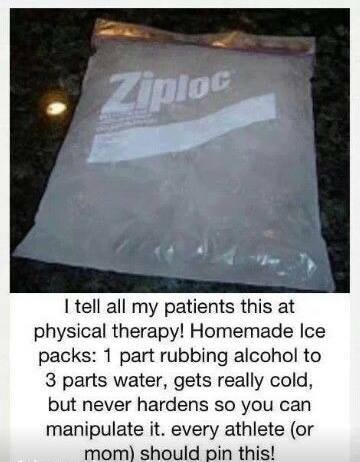 HOMEMADE ICE PACKS: 1 PART RUBBING ALCOHOL TO 3 PARTS WATER, GETS REALLY COLD, BUT NEVER HARDENS SO YOU CAN MANIPULATE IT. EVERY ATHLETE (OR MOM) SHOULD PIN THIS!